As fires continue to rage across California, destroying life and property, our thoughts and prayers go out to those affected. 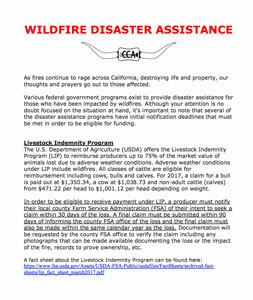 Various federal government programs exist to provide disaster assistance for those who have been impacted by wildfires. Although your attention is no doubt focused on the situation at hand, it’s important to note that several of the disaster assistance programs have initial notification deadlines that must be met in order to be eligible for funding.